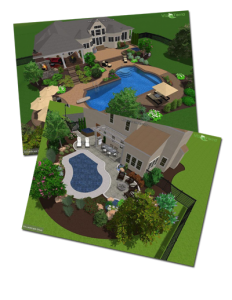 Landscape Design & Project Management Mechanicsburg PA & New Cumberland PA | PA Landscape Group, Inc. Landscape Design & Project Management Mechanicsburg PA & New Cumberland PA | PA Landscape Group, Inc.
At PA Landscape Group, the design process is of the utmost importance to us. It all begins here! Just as there were plans to build our highways and bridges, your car, and your house, we have to have that same blueprint to accomplish what we hope to achieve. We have 2 options when it comes to the design process, and both are described in detail below. The first is the ‘Designer Retainer Process’, with the second being the ‘Straight Design Process’. If you are interested in a project, please read these over and decide how you would like to proceed in our design process. Our preferred method is the ‘Designer Retainer Process,’ which has a number of advantages for you, the client. Meet with the client at the site to discuss the scope of the work to be performed. Discuss budgetary figures with client of projects with similar scope. Designer will prepare sketches for scope of work discussed in initial consultation. Estimator will prepare a Budget Estimate for the scope of work shown in sketches. 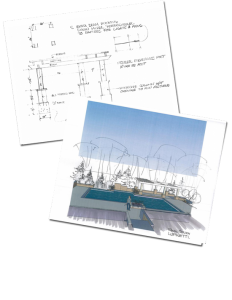 Sketches are presented to the client and reviewed with designer or estimator. Budget Estimate for sketches is reviewed with the client by the designer or estimator. Budget is established by the client and the Design Retainer Document is signed with a 10% retainer fee paid to PA Landscape Group Inc. (This fee is applied toward design and project management fees, with the remainder being applied to the scope of work if PA Landscape Group Inc. receives a signed contract from the homeowner within a six (6) month period for all or a minimum of 80% of the budget estimate.). See Design Retainer Contract here. Landscape Plan is drawn to scale including items such a hardscape/structure layout, planting, lighting, fence, etc. Perspectives will be provided based on landscape plan. Plan will be presented for final approval. Contract for total project will be presented for signature. 1. Design Retainer clients receive priority in the design schedule. 2. 100% of the design fees are applied to the cost of the project. 3. At the time of signing the design retainer, the client is put on the schedule for the work to be performed. This means that there will not be a delay in scheduling while plan revisions and contract are completed. Site Analysis: Initial meeting with client to discuss the scope of work. Basic mapping measurements and elevations, existing site data, plant inventory, picture documentation, etc. Budget Estimate: Design work is completed and both parties understand what is going to be installed, whether in phases or a complete installation, job scope, warranty, terms, etc. The estimate of the cost of the job will then be presented to the client based on PA Landscape Group Inc. installing the work. Maintenance Proposal: To ensure your new landscape/outdoor living investment continues to grow and develop as you and your designer have envisioned, a maintenance proposal will be presented for the client to review, revise, or approve. Changes at this point may be subject to a revision fee of $75.00 per hour, plus materials. Additional fees may be charged for permits, consulting, additional meetings, travel, etc. The client will always be notified in advance of any additional charges. Let PA Landscape Group Inc. plan your outdoors. Our experienced award winning staff can design, plan and supervise your landscape project, serving as general contractor for exceptional project management. As experts in the design and flow of the outdoors, let us be the first step in the overall design phase. For example, want to add a pool to your yard? Come to us to help you in the siting of it! We can place the pool properly in regards to movement around, drainage, and any possible current or future outdoor living constructs, such as outdoor kitchens, pergolas, and fire features. We can design and co-ordinate the various features of your outdoors! Need help visualizing materials, colors, paver design and textures, plants, fixtures, and appliances? Stop by and see our outdoor display area at our home office! You can do it on your own or plan to meet with a designer. For pictures, click here!